Modern contact center technologies make it possible to measure and track large amounts of data that reflect the way a company functions. The prevailing number of call center managers are able to tell most facts related to their companies, starting with the average speed of answer observed last month and up to the average handle time that was tracked the day before. Though this information is quite meaningful for the analysis of contact center performance, it seems to be essential for a company’s managers to be able to analyze this info and draw reasonable conclusions. In most cases, however, we observe quite a discouraging situation. Those managers that have the above mentioned data at hand just cannot find answers to simple, but significant questions: How well a call center they run is currently performing and is there anything that may be done to change the situation for the better? If you do not wish to face the same situation, then you should realize how important KPIs (key performance indicators) are and what role they play when it comes to the measurement of contact center productivity. These indicators enable managers of these companies to track, identify and find solutions to the most frustrating call center performance problems as well as to establish long-term and short-term performance objectives and ways of achieving them. The overall amount of call center metrics may seem to be astounding at first sight, but this does not mean that you should apply all of them. By the way, this is one of the most frequent misconceptions some contact center managers have when it comes to the evaluation process. In most cases, it is enough to develop and introduce around 8 or 10 metrics for effective performance measurement. Some of the top metrics that may come in handy to you here are: average handle time, average speed of answer, first-call resolution rate, personnel and customer satisfaction, services levels etc. Thus, quality of customer servicing is interrelated with the level of customer satisfaction, since it shows how well an agent performs his/her tasks and if a potential client is satisfied with the level of servicing or not. 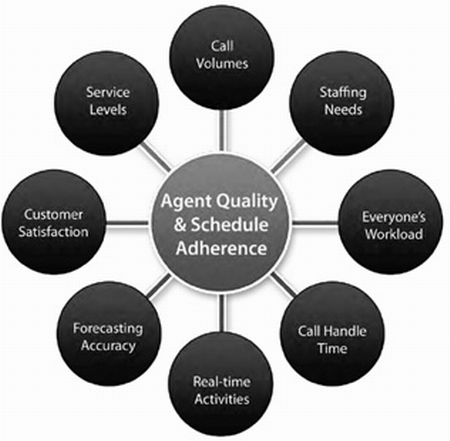 Average handle time metric is generally developed to measure the amount of time an agent needs to handle a standard call. 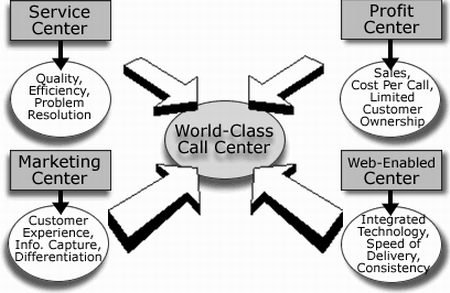 It is not difficult to assume that this indicator is connected with customer satisfaction as well, because the quicker and the more effectively a problem is handled, the more desire a person will have to deal with a particular call center. First call resolution helps trace the percentage of customers that had their problems solved from the very first try. These metrics will help you analyze the efficacy of your business performance and maximize your profits.